Visiting Bali is certainly not complete without water sports. There are many choices of water sports that can be done in Bali. But I choose water sports in Tanjung Benoa. There are various prices offered for water sports in Bali, ranging from the cheapest one to the most expensive one. These are watersports that I do with an affordable price. I managed to get the best deal for water sports in Tanjung Benoa with only IDR 800K, you can do diving, parasailing, banana boat, and sea walker. This was my first dive experience. At first I was afraid because at that time I'm not good enough at swimming. 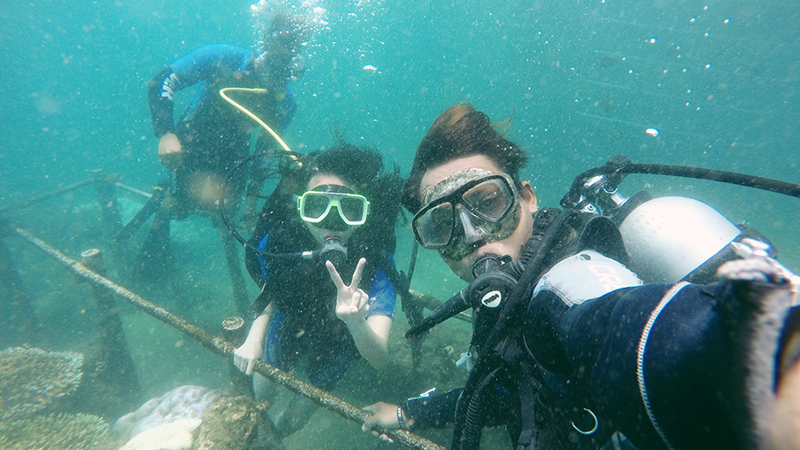 But thankfully I was given an instructor to accompany me during the dive. Because still a beginner I just dived in the depth of 5 meters. I dive in a location that is already reserved for divers tourists. Therefore at the bottom of the sea, you can see the pipe which can be used to hold on if you find it difficult to swim. At that time I was given a plastic bag of bread to feed the fish, but that is a bad idea because if you feed the fish you can disrupt the underwater ecosystem. 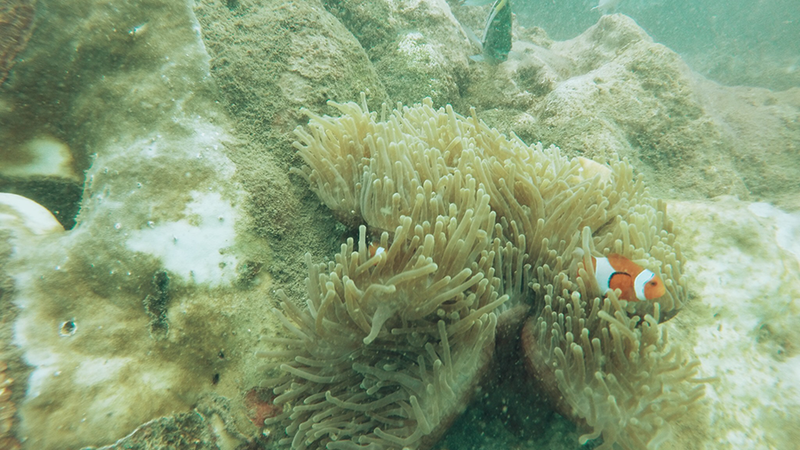 Plus my diving instructor left the plastic waste scattered in the sea which is not good for underwater ecosystems. 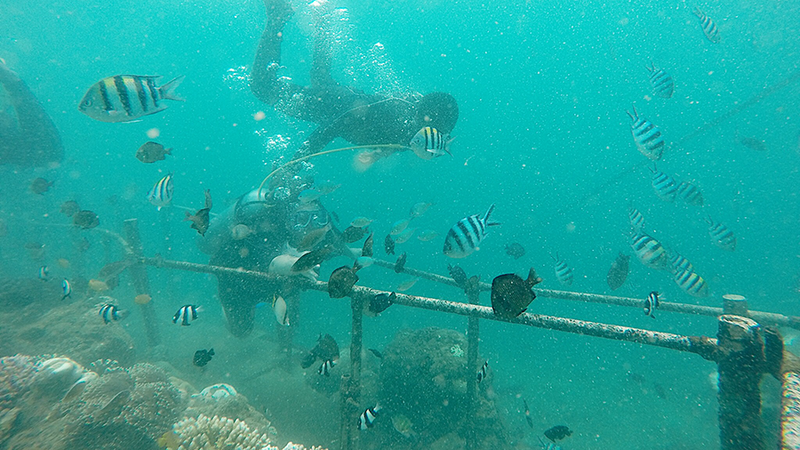 So I strongly discourage for feeding the fish when you dive and letting the plastic waste just like that. The next thing I got from the package is parasailing. Parasailing is an activity where you will be hung in a parachute and will be towed by speedboat. So you will flying and can see the view from above. For parasailing, you have to control your own parachute but you will be guided by the instructor who stay on the beach and talking by using the loudspeaker. 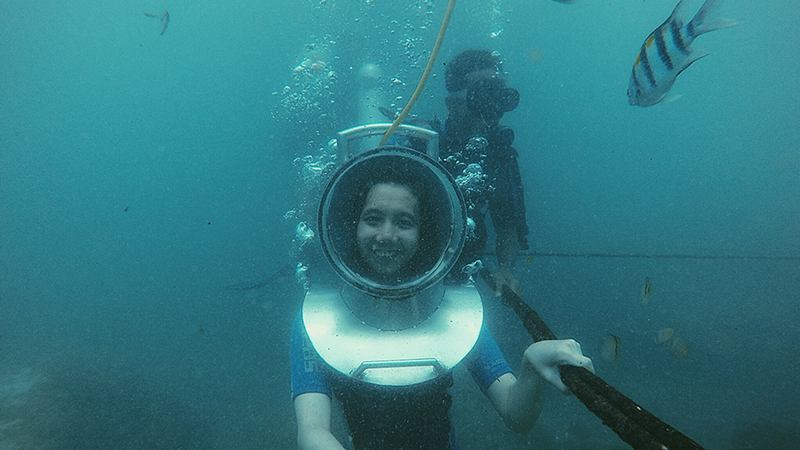 As a sea walker, you will wear an air helmet and can walk on the seabed freely. There is a path for you to hold on to. 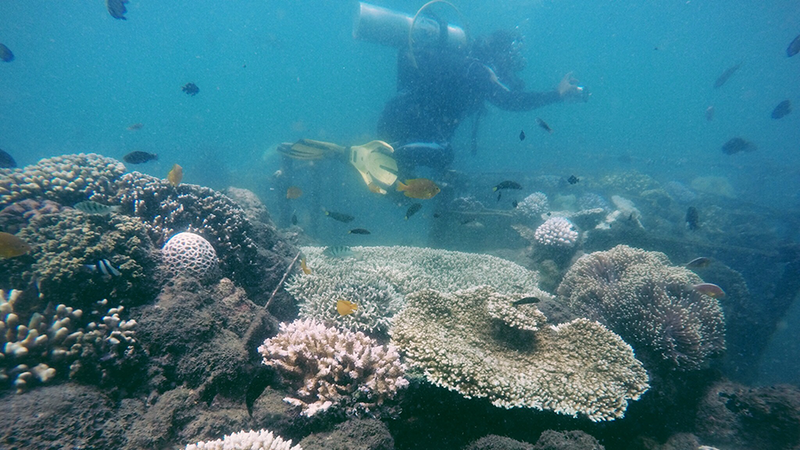 You will also be accompanied by one instructor who will take care of you while you are under water. That is a water sport that I did while I was in Bali. With an affordable price, you can also have fun. You can also read any tours that you can visit in Bali in How I Managed to Explore Bali Within 3 Days.